The German postdoc is working with researchers at the MAX IV Laboratory and Lund University to develop a new method for probing protein structures using X-rays and neutrons. The expanding field of protein crystallography has wide implications for medical and life science research. LUND—As the focal point of the global neutron science community, the European Spallation Source (ESS) is preparing the next generation of neutron researchers to maximise the impact of the facility’s unique capabilities, unprecedented power and world-leading scientific instruments. This is happening locally in Sweden and Denmark through engagement with the many research universities clustered in Scandinavia. The scope of the project is large, including 176 six-month-long experiment projects performed at operational neutron and light-source facilities and an educational component including courses, workshops and summer schools. Collectively, the project makes possible 1,000 months of training and 500 months of instructor time with senior researchers. Scientists at ESS acting as supervisors in the program are Pascale Deen, Zoë Fisher, Paul Henry (now at the ISIS Neutron and Muon Source in the UK), Andrew Jackson, Markus Strobl (now at the Paul Scherrer Institute in Switzerland) and Robin Woracek. Janina Sprenger, originally from Germany, received her PhD at the Medical Faculty of Lund University (LU), where she focused on how to develop medication against diseases like malaria. Sprenger is now a postdoc in LU's Biochemistry and Structural Biology Department performing research centred on protein crystallography. The development of new methods for probing protein molecules and other biological samples is critical to ongoing research to discover cures for diseases including Alzheimer's and cancer. One of the key benefits of the high neutron flux at ESS is that it will allow for the study of samples that currently are too small to be probed by instruments at existing neutron facilities. This capability will open up broad new areas of research with neutrons in the biological and life sciences. This interview was first published in the ESS & MAX IV: Cross Border Science and Society newsletter on June 21, 2017, and has been lightly edited. Janina Sprenger first encountered Lund University through an Erasmus project in 2008, which was a part of her Masters program in biochemistry at the University of Potsdam in Germany. While in Lund, she was introduced to structural biology and methods for crystallizing proteins. Later, she continued her PhD at the Medical Faculty at Lund University focusing on how to develop medication against diseases like malaria. After completing her PhD, Janina joined Sara Linse's research group at the Biochemistry and Structural Biology Department at Lund University, where she is now involved in several research projects. One of these has been funded within MAX4ESSFUN. X-rays can be used to give structural information of biomolecules that allow us to understand their functions in the cell or how to cure diseases. Nowadays, X-ray crystallography is the most used method to obtain atomic-resolution structures of proteins. This method requires that the proteins can form a crystal. Janina is already quite experienced in using X-rays and has conducted several experiments at different synchrotron facilities, including ESRF in Grenoble, DESY in Hamburg, Diamond Light Source in the UK, and MAX-lab in Lund. In the future she believes that a neutron source like the European Spallation Source (ESS) could be very useful for her research. Neutrons have the unique ability to identify Hydrogen atoms in a molecular structure, of particular significance when probing water-dominated protein crystals. Research in this field is currently limited in part due to the difficulty of producing protein crystals large enough to be probed with neutrons. The high neutron brightness of ESS will enable the probing of smaller protein samples, and thus represents a significant expansion in this type of research. Janina is sure that she will continue using research facilities such as ESS and MAX IV in the future. The Interreg experiment mainly focuses on developing new methods to study protein structures. Janina's research projects include experts from Lund University, MAX IV and the US. She explains that the international team is important because the partners have complementary skills that they put into the project. Janina participated in the annual MAX4ESSFUN meeting and the “Synchrotron and Neutron Scattering” Interreg workshop in October 2016. She thinks these kinds of activities are very valuable. 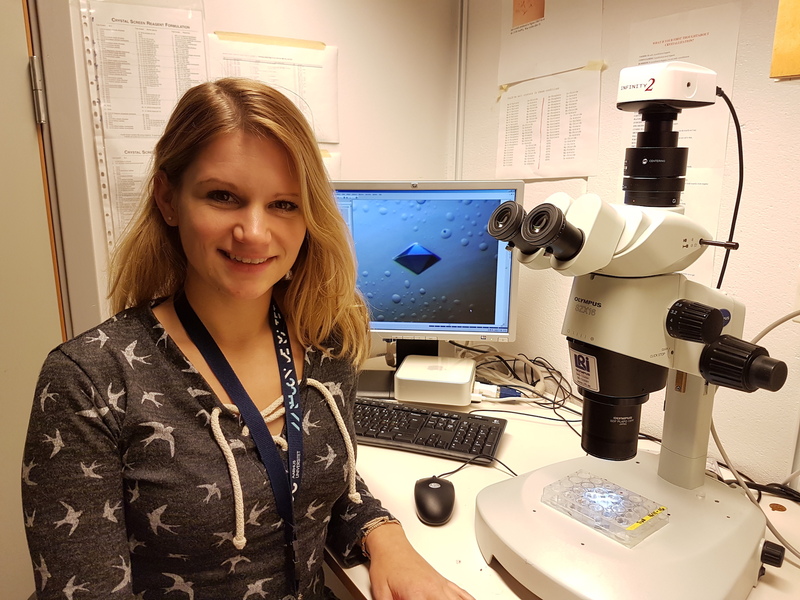 Janina Sprenger received her PhD at the Medical Faculty of Lund University, and is now a postdoc in protein crystallography at LU's Biochemistry and Structural Biology Department.